Hollywood, CA – In 2008, concert giant Live Nation resurrected the historic venue Hollywood Palladium with an epic JAY-Z concert attended by celebrities including former Laker Derek Fisher, iHeartMedia personality Big Boy and current L.A. Mayor Eric Garcetti. 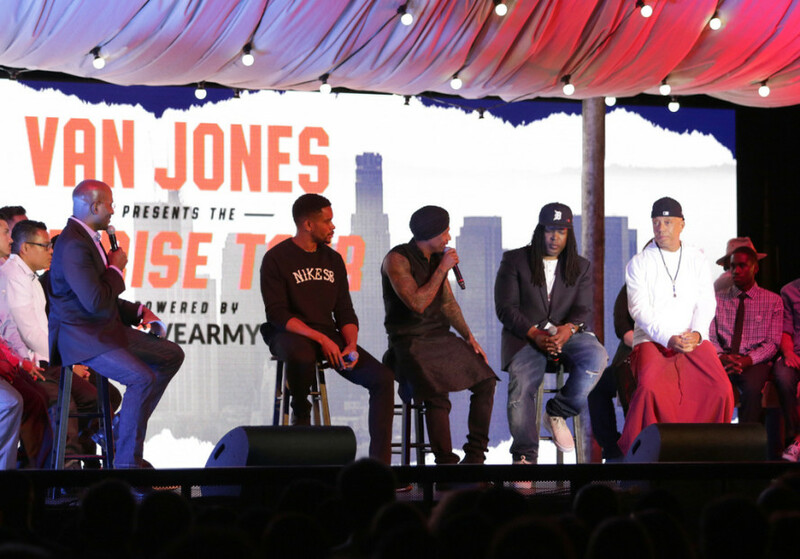 It’s only fitting that on July 26, the venue – via a partnership with Roc Nation – was the first to host former Barack Obama advisor, CNN commentator (and recent Roc Nation signee) Van Jones’ multi-city WE RISE TOUR powered by #LoveArmy. As a prominent figure in media who may very well be testing the waters for a future political campaign, Jones still may seem like an odd name to see on a concert venue marquee. However, the author of two books (who has become known for championing the green job movement, prison reform and generally, any and all political agenda this side of Vermont and U.S. Sen. Bernie Sanders), was well within his element. Still, WE RISE clearly was not designed to focus on Jones alone. The Tennessee native effortlessly switched between host, MC, preacher, comedian and interviewer throughout the two-hour long event, which was essentially part-conference, part town hall and part concert. With well under a thousand people in the audience at a venue that hosts sold out concerts, Chicago’s rising emcee The Boy Illinois kicked off the night with a quick and energetic set. Sitting on the stage were a dozen participants in the Anti-Recidivism Coalition, a local nonprofit that WE RISE decided to spotlight on this particular night along with the #cut50 movement. After a brief intro from the CEO of Dream Corps, a nonprofit organization co-founded by Jones, the Yale Law School alumnus strolled onto the stage to a warm round of applause. Next, Jones introduced Marta Kaufmann, YoNasDa LoneWolf and Mila Kuda, all women’s rights advocates who’ve become activist rockstars in their own right after taking in part the Dakota Access Pipeline protests and other protests. “It’s in our DNA to fight hate with love,” Kaufmann said. Next, the audience was shown a preview of “Crown Heights,” an upcoming feature film produced by former NFL player – and Kerry Washington’s husband – Nnamdi Asomugha. He then walked out, joined by Nick Cannon and Russell Simmons. The back-and-forth banter between Cannon and Jones went from jokes to serious very quickly, as Mariah Carey’s ex-husband, a San Diego native, passionately described his childhood experience visiting relatives behind bars. He said to this day he felt it’s important to visit juvenile halls “on Saturday mornings” because as a celebrity whose every move is watched by millions, he can effect change. A short but very poignant video clip feature San Quentin prisoners bookended the panel. To wrap up the evening, Jones and company closed out with a rousing performance from Jahi of Public Enemy, an MC who later clarified on Twitter that “Public Enemy 2.0” displayed behind him on stage is a reference to his carrying the “cultural legacy” of PE and Chuck D.
The WE RISE TOUR continues in a number of cities across the U.S. For more information and to buy tickets, visit the official #LoveArmy website.